After previously writing about local water use for industry and power generation at Funter Bay, I came across a few more maps of such projects. 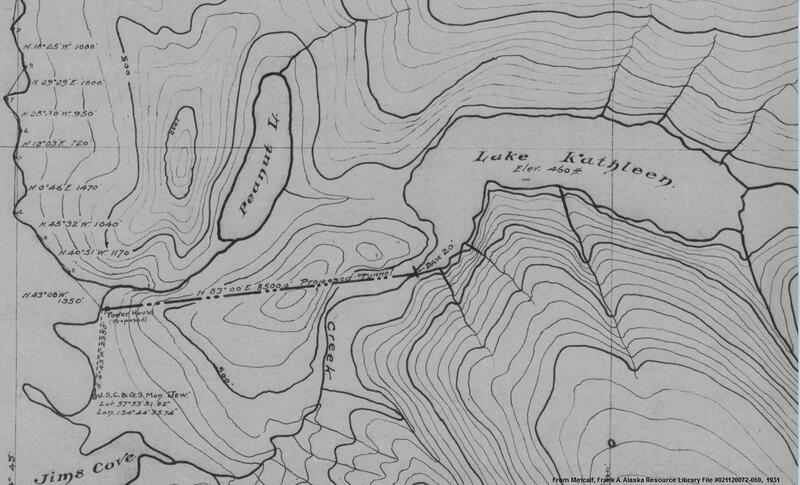 The first, below, shows the pipeline from the Thlinket Packing Co cannery to “Nimrod Creek”, near “Pipeline Meadow” (local names). This creek is one of the larger and more reliable water sources convenient to the cannery. 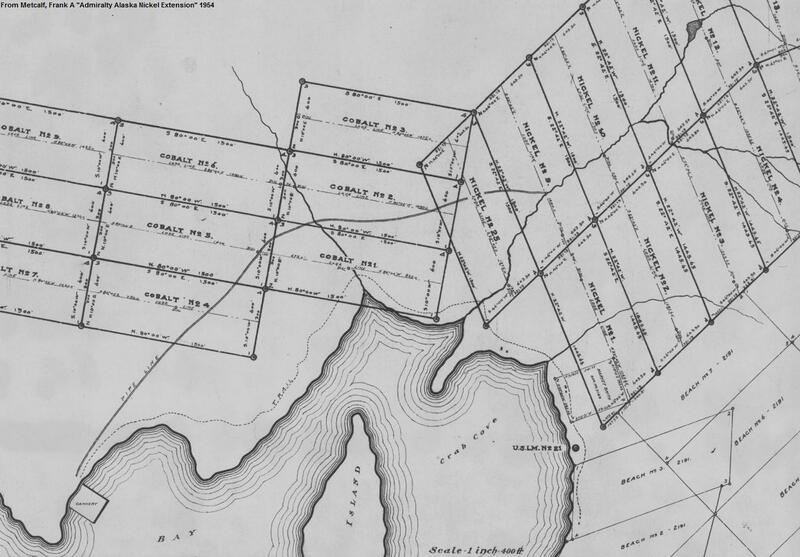 The grid lines on the map are old mining claims which have since lapsed. The small pond at the upper right is from a long-existing beaver dam which can still be found today. The Lake Kathleen project was a 1931 proposal to construct a hydroelectric station, fed by water from a tunnel. Power would be used at Funter Bay for an electric smelter. Electricity would have been transmitted to Funter Bay over lines strung along the beach for approximately 30 miles. The power line itself was considered relatively trivial once the necessary permits were acquired to use Tongass National Forest land and the tunnel had been dug. 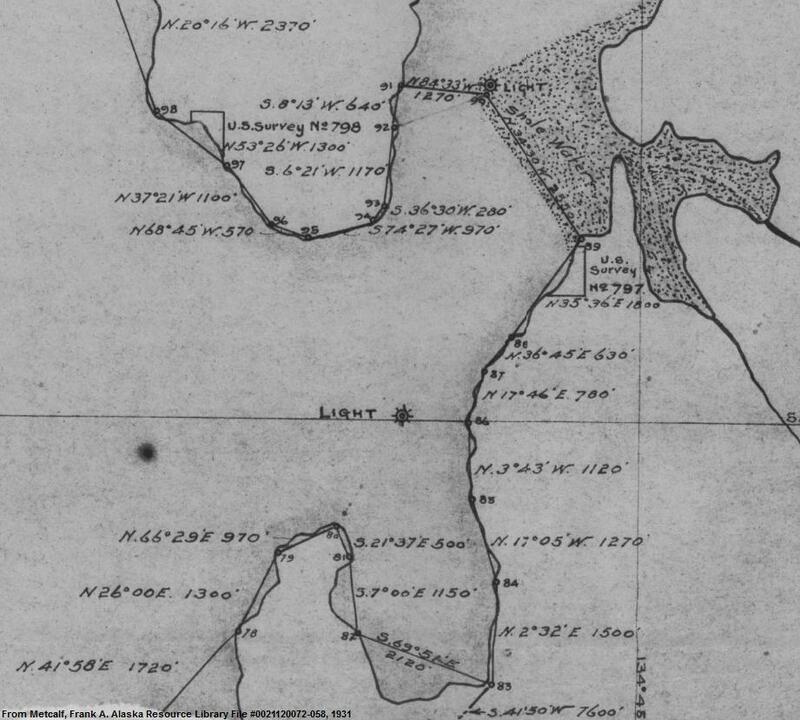 The major choke point would have been the crossing of Hawk Inlet, but this was planned to use a sandbar to build poles partway across the water. The high flow and storage capacity available at Lake Kathleen outweighed the inconvenience of distance. Precedents for such a project included the Chichagof Mine at Klag Bay, as well as various other power projects around Southeast Alaska. Today many communities in Southeast Alaska rely on distant hydroelectric stations. Ultimately the Lake Kathleen project never materialized, either due to a lack of funding or other issues. Today the Greens Creek mine is located at Hawk Inlet much closer to this lake, but uses an underwater power cable from Juneau instead of local sources. Meanwhile, the Lake Kathleen area has been clearcut from the Cube Cove logging camp. When large single sources of water were not available or practical to tap, another trick was to connect multiple sources with a lateral ditch. This technique was widely used throughout Alaska, from Nome to Fairbanks to Juneau. Engineers would pick an elevation contour and build a ditch at that level, exactly following the horizontal bends of the hillside while maintaining a slight vertical drop to keep the water flowing. Streams along the route were intercepted and diverted into the ditch, which eventually dumped their combined flow into a pipeline or another (previously smaller) stream where the water was needed. 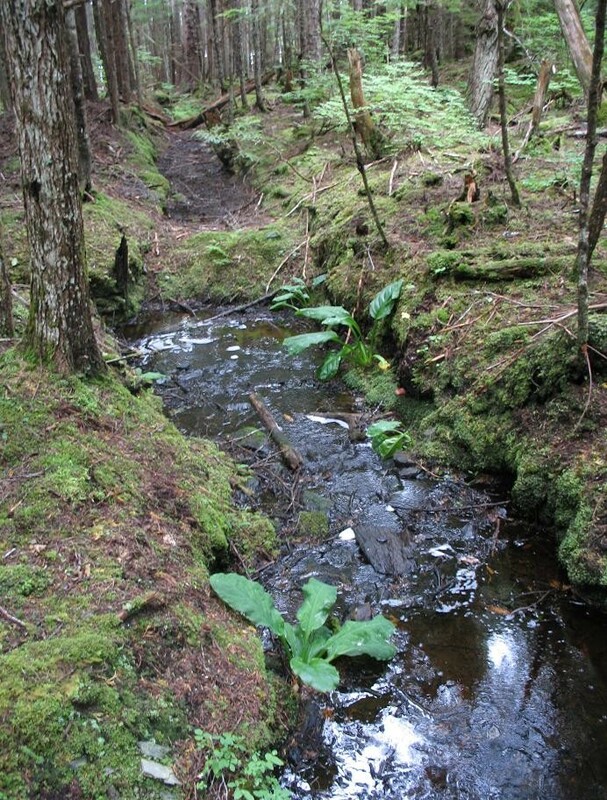 At Funter Bay, ditches and streams were sometimes daisy-chained, with one stream diverted to another, then that (now combined) stream diverted again farther down its course. This took advantage of different optimal contours for each leg. Ditches were relatively cheap to dig, but had the disadvantage of needing constant maintenance. They were eroded by use, damaged by ice, blocked by fallen trees, and tended to fill in with silt, leaves, and other debris. This entry was posted on Sunday, December 22nd, 2013 at 4:32 pm and is filed under Alaska History, Funter Bay History. You can follow any responses to this entry through the RSS 2.0 feed. You can leave a response, or trackback from your own site.